Digitally Imported is the highest ranking and most listened to digital radio network for electronic music fans around the globe. Tune in to listen to 60+ free channels of the best electronic music available. Each one is hand-programmed by a channel manager who is an expert in that style. Find all your favorite styles including Trance, House, Dance, Lounge, Chillout, Techno, Ambient, and many more. 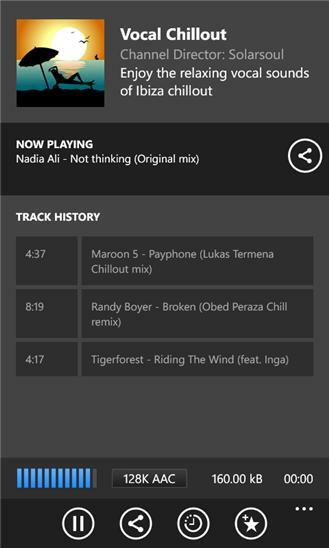 We have been serving the beats to a global audience for a full decade, and now Digitally Imported is available anywhere you want to listen with your Windows Phone. Visit our website at http://www.di.fm to learn more. 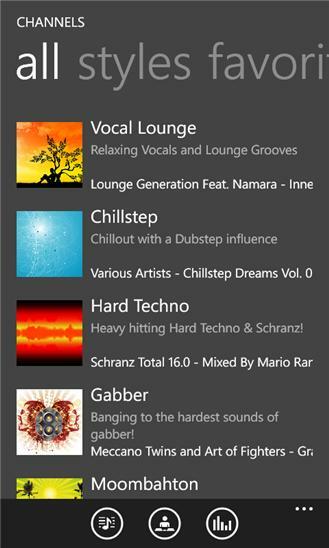 FEATURES: - Listen to 60+ hand-programmed electronic music channels - Not sure which channel to pick? Explore the easy-to-use Styles list - Stream music from the app or in the background while you do other things - Control audio and view track titles from the lock screen - Save your favorite channels for quick and easy access later - View current and upcoming exclusive radio shows on Digitally Imported - Sleep Timer to fall asleep to music without draining your data plan - Set data streaming preferences for when using a Cellular vs. WiFi network - Share your favorite tracks and channels on Facebook, Twitter, or by email - Optional buffer bar with data display helps you keep track of your data usage - Try DI Premium for free for 7 days within the app to listen to commercial-free streams Bug fixes.